Even the most jaded cynics would agree: Bruges is one super good-looking city. Undeniably, there’s a buzz of romance in the air, even when arriving disheveled and alone (AKA the name of my eventual autobiography). 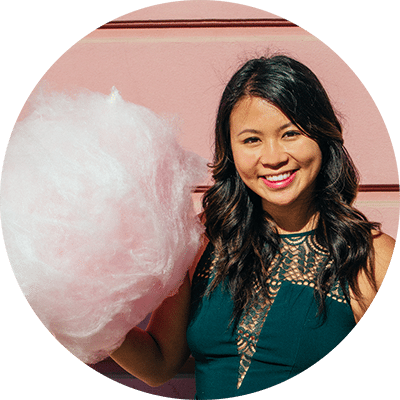 It could be the fact that the city’s prettiest facades arrange themselves over winding canals or maybe that the streets often smell randomly of chocolate. Regardless of the reason, Bruges is a city well deserving of its longtime reputation as Europe’s most idyllic fairytale town. If it’s postcard-perfect places you’re after, this is the post for you. Here are all the beautiful must-sees you can’t miss when you’re in Bruges. 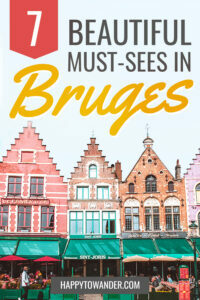 Pssst, hoping to escape the tourist musts and do some more alternative things in Bruges? Be sure to check out this list of more offbeat sights and attractions! A huge thanks to Visit Bruges for hosting me during my stay! Bruges’ market square is the city’s #1 tourist hotspot, flanked on all four sides with picturesque perfection. There’s the Belfry Tower, the most iconic resident of the Bruges skyline, the beautiful Historium building, and of course, colourful buildings wrapped around the square, as if in some gingerbread Christmas display. 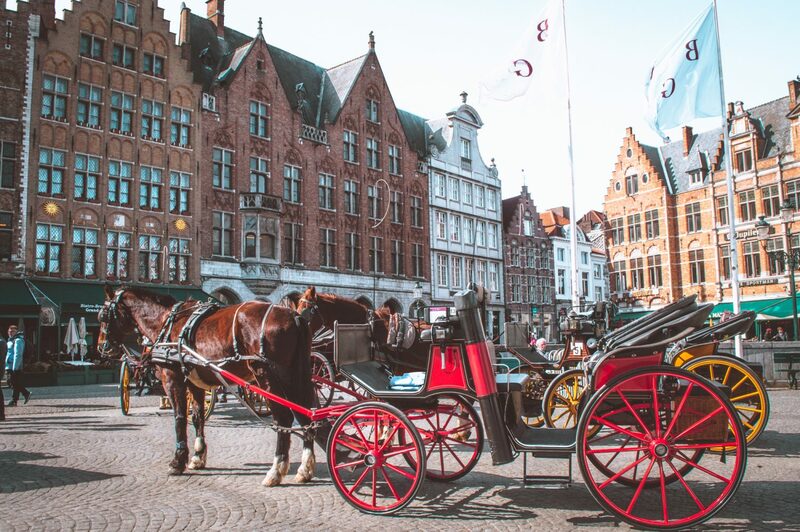 After getting your mandatory photos #forthegram, grab yourself a drink at one of the many restaurants or cafes in the square – the people watching (and gentle clip clop of horse carriages) are too good to miss. BONUS TIP: Be sure to walk into the Belfry courtyard for a unique perspective of this important monument. A lot of people skip this, which means it’s a quick, peaceful escape from the bustling crowds outside. Of course, the magic of Bruges is one that is best appreciated from above. 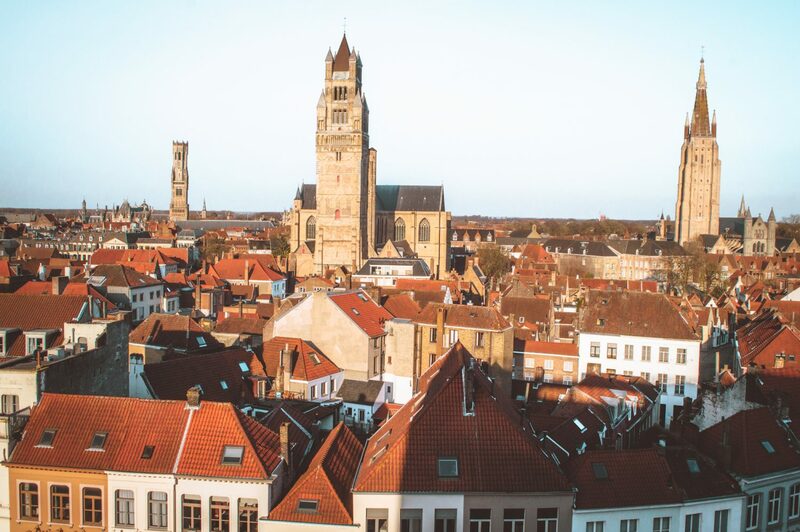 While most opt to climb the 366 excruciating steps to get to ascend the Belfry (with its wonderful view over Markt), there are other (less physical) ways to get a stunning view, including from the Concert Hall and the roof of the De Halve Maan Brewery, a view included with the price of your tour. If you’re interested in other offbeat alternatives in Bruges, be sure to check out this article. 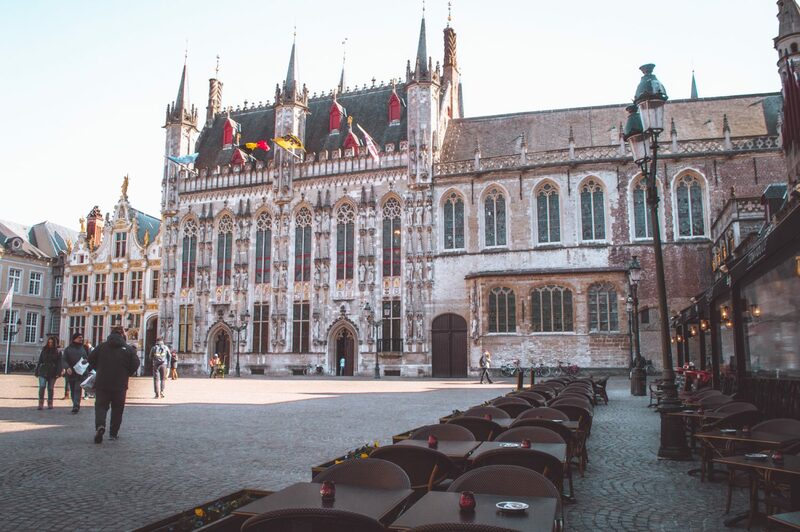 The mish mash of architectural styles in the Burg square is what makes it such a beautiful must see when in Bruges, from the gothic Town Hall (one of the most beautiful buildings in the city) to the elegant Baroque Deanery of of Saint-Donatian. If you’re lucky enough to catch the square when there’s a market taking place, be sure to take advantage. The stall-owners are all really friendly. 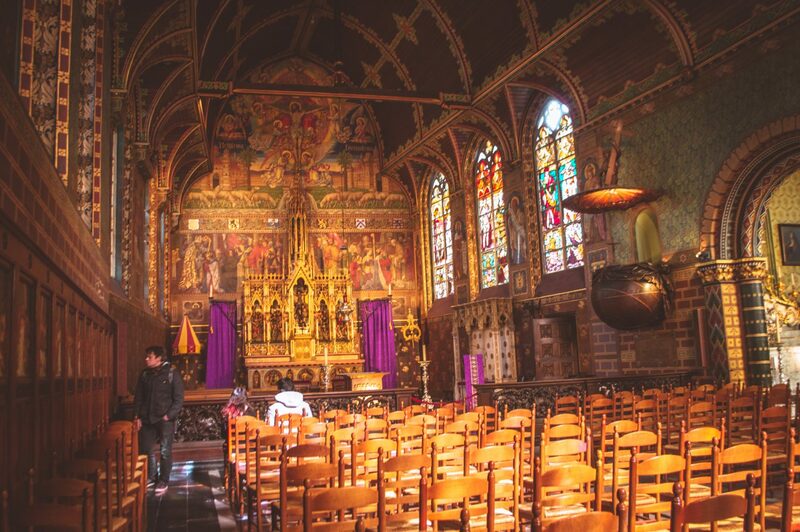 While exploring Burg Square, be sure to make a stop inside the world-famous Basilica of the Holy Blood, famous for a relic said to contain the blood of Jesus Christ, taken to Bruges during the second crusade. Once inside the church, a simple, unassuming stairwell leads to a delicately ornate upper chapel, a real must see when you find yourself in Bruges. BONUS TIP: During certain hours of the day, there is the “veneration of the relic” during which you can take a look at it yourself. You can find the exact hours here on the church website. During the veneration of the relic, no photos are allowed of the relic itself, but you are able to buy candles, sign a guestbook and get an up-close look. Translated to Rosary Quay, the Rozenoedkaii is probably one of the most photographed places in Bruges. 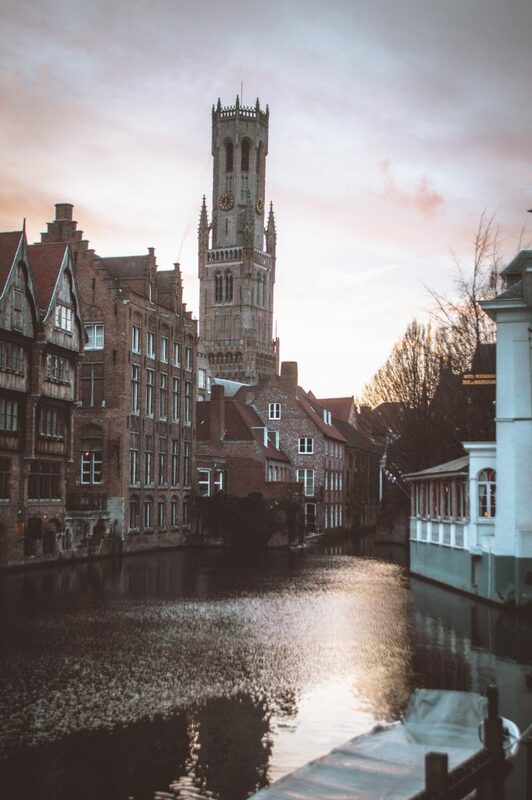 With a view of the towering Belfry over the flowing canals that Bruges is known for, this corner of the city offers up one of the “Brugiest” views you can find in the city. In my opinion, the best time to come is at sunset, after many day trippers have gone home. The colours lighting up the sky (and the relatively fewer crowds) turn this already magical spot into something truly special. 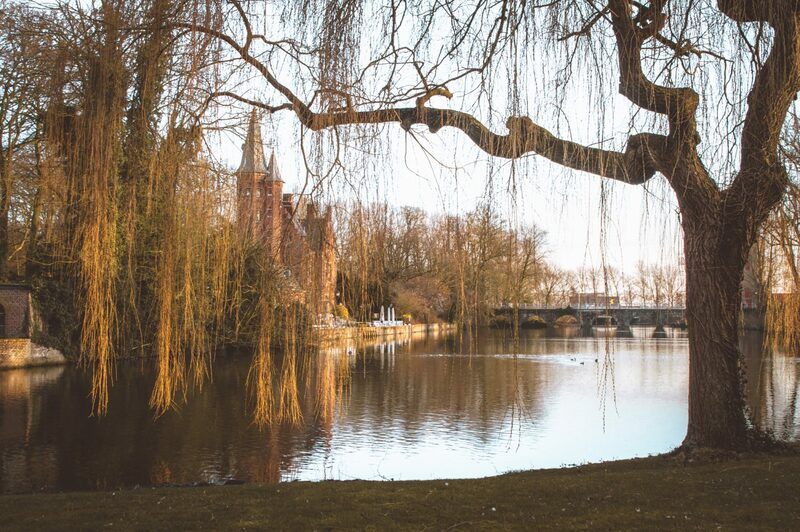 It wouldn’t be an article about Bruges without mentioning something cringly romantic, and here it is: Minnewater – the Lake of Love, a picturesque lake filled with swans gliding past like a scene out of the Notebook. This spot is of course best viewed while holding hands with someone you love (or in my case, an ice cream the size of my face). 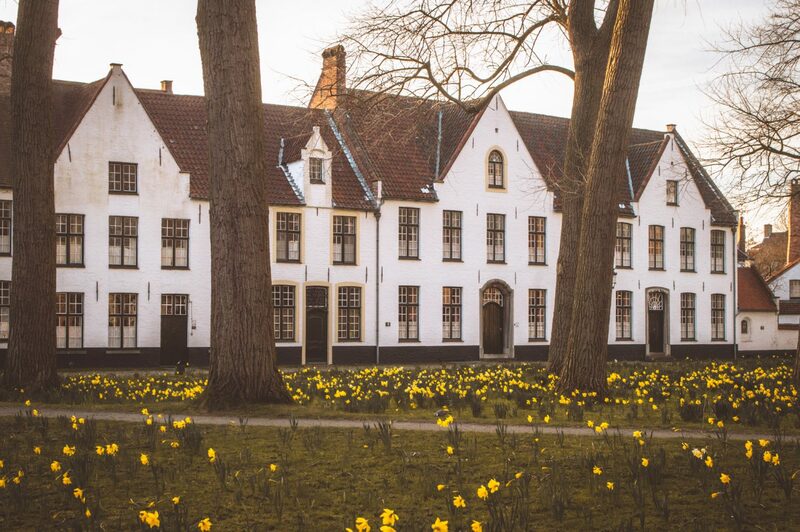 Last but not least… if, after a long day of sightseeing, you want to take in some peace and quiet, look no further than the beautiful Beguinage, once home to the pious beguines of Bruges. Here, the simplicity of the white gables surrounding the lush inner garden makes for the perfect photograph, especially at sunset. Pro tip: Come during the Spring as I did and swoon over the countless yellow daffodils in bloom. Bruges was never on my travel radar until I saw your pictures. It looks gorgeous! You seriously need to go! It’s so pretty <3 Put it on the list haha.